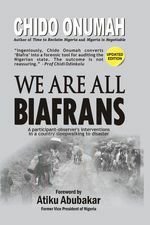 Chido Onumah (April 10, 1966) is a Nigerian/Canadian journalist, author, blogger and rights activist. He has worked for over two decades as a journalist, rights activist and media trainer in Nigeria, Ghana, Canada, India, the USA, the Caribbean and Spain. Onumah studied philosophy at the University of Calabar, Nigeria, and received an MA in journalism from the University of Western Ontario, London, Ontario, Canada. He is currently a doctoral candidate in communication and journalism at the Autonomous University of Barcelona, Spain.